Gorgeous Tidewater Villa and only a few years young. 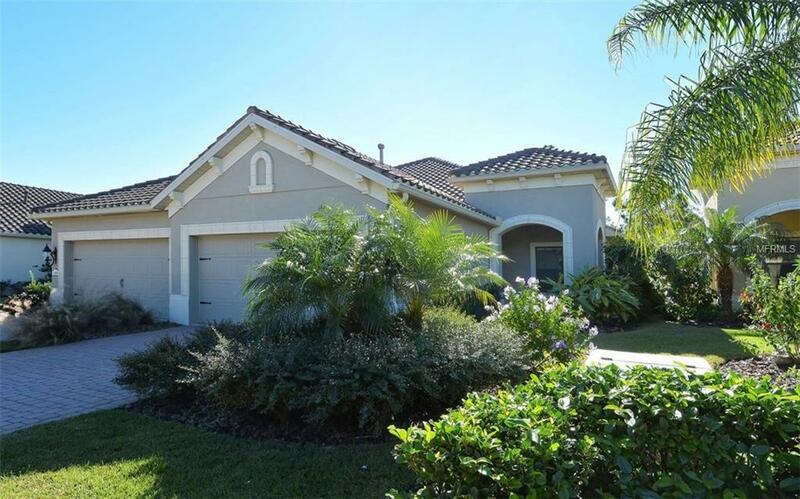 Dont miss out on this stunning, maintenance free home in the much sought after community of Grand Palm. Why wait to build and pay builder fees when you can buy now and move right in. This 2 bedroom / 2 bath home has an abundance of upgrades including a 2 car garage; full gutters and downspouts; paver driveway; walkway; and front patio. From the moment you arrive, enjoy the newly landscaped front entry way and the thoughtful and personal design options throughout. A beautiful glass front door welcomes you inside where youll find an open floor plan with tray ceiling, custom lights and ceiling fans, granite countertops, upgraded wood cabinets, 18 ceramic tile flooring, spacious Office/Den, SS appliance package, cultured marble counters in both bathrooms, walk-in roman shower in master bath, and walk-in closets in both bedrooms. This home has a wonderful floor plan for easy living and entertaining family and friends with pocket sliding doors that open to the extended lanai and private backyard experience. Highly energy efficient with automatic timer exterior garage coach lighting. Grand Palm is an amenity rich community with very low fees, including 2 heated pools, fitness center, club house, tennis, basketball and 29 miles of walking/biking trails. Why live anywhere else, close to everything and far from ordinary. Included with the sale a Home Warranty Protection Plan for peace of mind.